Silence is radical. From mute words to the silence of children, from spiritual places to silence in the form of peace, silence is like nature and like ambience. The Paliano Town Council presents INSIEME IN SILENZIO (TOGETHER IN SILENCE) curated by Zerynthia, Voluntary Contemporary Art Association, the 2nd edition of an education project that this year sees the involvement of the Fine Art Academies of L’Aquila, Brera, Rome, the Istituto Europeo di Design of Rome (IED) and two foreign institutes, Villa Arson of Nice and the École nationale supérieure d’arts de Paris-Cergy. The students selected by the institutes participate in a three-day workshop run Paolo Coteni, one of the first tutors to teach sound art in Italy. A course of sound research in order to create a collective work: a sound portrait of the city of Paliano. The event will be accompanied by a series of sound art pieces located in various parts of the city: the Colonna Chapel in Contrada Cervinara, the hall of the ex Pretura, the Wine Museum–Municipal Winery, the Paliano City Hall (that will function as a workshop for the selected students), the Choir and the Library of the Monastery of Santa Maria di Pugliano. There will be sound and video works by: Arturas Bumsteinas, Francesco Fonassi, Liliana Moro, Fabio Perletta, Dmitry Prigov, Donatella Spaziani, Vladimir Tarasov, Antonio Trimani, Fosco Valentini with the poet Francesco Serrao and tracks by the Ensemble Georgika. Exhibited in the town centre will be the bright moon (My Private Moon) by Leonid Tishkov. The elementary schools of Paliano will be take part in a workshop curated by NOW New Operation Wave. 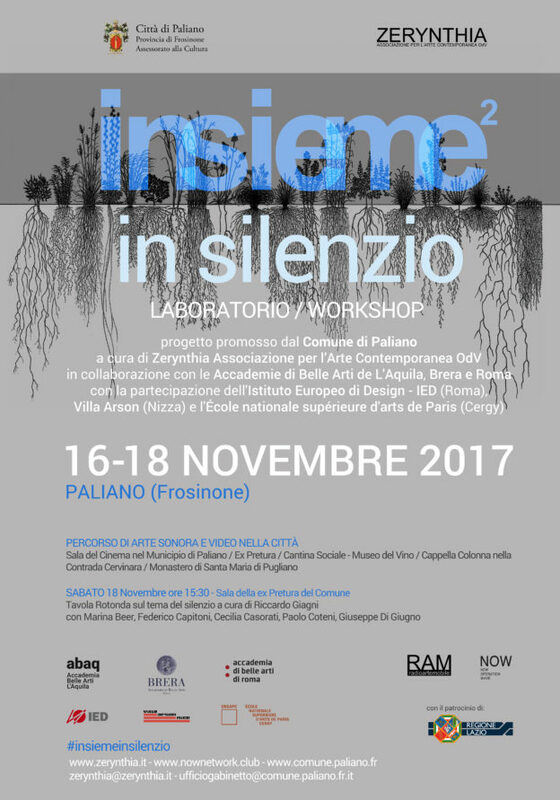 The children will be the protagonists of a group performance in the streets of Paliano creating a true “walls of silence”. 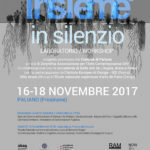 On Saturday 18thNovemberat 15.30 in the hall of the ex Pretura del Comune there will be a round table on the theme of silence, curated and moderated by Riccardo Giagni, musicologist and composer. Taking part will be experts on the subject from the visual, literary and musical spheres: Marina Beer, Federico Capitoni, Cecilia Casorati, Paolo Coteni, Giuseppe Di Giugno. “Maybe only silence really exists” (José Saramago).